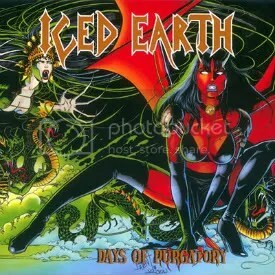 Days of Purgatory is a compilation featuring many songs from Iced Earth’s early career that were re-recorded in order to have definitive versions featuring Matthew Barlow on vocals (who joined in 1994). It was the very first Iced Earth album I ever purchased and I did it because it was recommended to me as a starting point for the band. 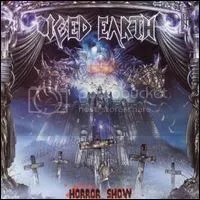 Iced Earth was a name I kept coming across online as a great metal band and I wanted to sample them. Despite this album’s purpose to be showcase for Barlow’s vocals, it’s his vocals that have deterred me from ever becoming an Iced Earth fan. I just don’t like his sound. I bought this album in either December ’98 or ’99 and I remember listening to it with a friend and we both remarked how some of the music was really cool (“Angels Holocaust” especially) but the vocals were holding it back. Truth be told, looking back, even some of the music isn’t up to snuff for me but there are a few great thrash moments. I’ve always loved the cover though. It features the comic book character and vampire goddess Purgatori with art provided by the late Steven Hughes. A two-disc edition was released at the same time. Too bad I didn’t know anything about it when I bought this one disc version! This, the second Iced Earth album I ever picked up, was the one I was most excited about. An album about all kinds of monsters? Dracula, Frankenstein, Jack the Ripper, the Mummy..? Awesome! Sadly, this was just another disappointing Iced Earth purchase for me. I don’t hate the band, I just think they’re fairly bland and were/are definitely hampered by Matt Barlow’s vocals. Funny enough, my favorite song from the album is the one song that doesn’t even fit the horror theme– “Ghost of Freedom”, which is more of a patriotic song (released just a few months before 9/11). It’s an odd choice to put on *this* album, even with a “Ghost” title. I guess the guys just couldn’t wait to release it! A GREAT concept, just not the right band to pull it off. Maybe Mr. Alice Cooper would like to take a stab at it someday? Iced Earth has never been a band I could get into. I own the Days of Purgatory compilation and Horror Show and I wasn’t impressed with either one outside of two or three songs. Barlow’s voice is hard for me to listen to. I can’t put my finger on it, but I just don’t like his singing. So why did I ever bother picking this one up? Well, I guess since it was a cover album, I knew the songs themselves were already great, and the preview clips didn’t sound too bad. I waited a few years before picking this one up though, because I was still so turned off by Horror Show. I had money to blow one day though, so I got it. I like it a lot and still find myself listening to it every now and then. Barlow’s voice still bothers me at times and I don’t think it works for a song like AC/DC’s “Highway to Hell” or Blue Oyster Cult’s “Burnin’ for You”, but this is about as solid of a cover album as you can find, in my opinion. 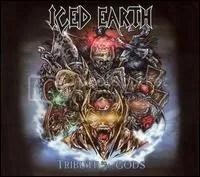 Iced Earth stays true to the originals with just a bit of extra heaviness thrown in.